About - Brian Gareau, Inc.
Leveraging 31 years of corporate leadership experience, Brian Gareau specializes in strategic, tactical, and practical solutions to engage and accelerate high performance. Brian is the author/co-author of four books: 180 Ways to Build Employee Engagement, A Slice of Life: The Benefits of Personal Engagement. 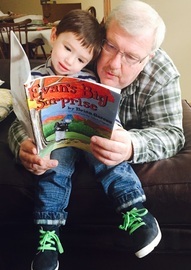 Evan's Big Surprise and Reagan's Special Tree; and contributing author of The Engaged Workplace: Organizational Strategies. He has been a featured speaker at: The Conference Board, Corporate Leadership Council, Society of Industrial and Organizational Psychology (SIOP), American Productivity & Quality Center (APQC), CUE, Dallas SHRM, CONEXPO, Con-Way Transportation, 3M, Texas A&M University, Snow & Ice Management Association (SIMA), SIGMA, McDonalds Corporation, DuPage SHRM, Kenexa, Crossroads United Methodist Church, and Bloomington-Normal HR Council. In April 2017, Crittenton Center presented Brian with the Dr. Cindy Fischer Kids First Award for Excellence for his consistent support to their mission.